Repent Bethel Redding | A site dedicated to warning people about a cult with worldwide influence, in Redding (CA), known as "Bethel Redding"
The Repent Bethel Redding blog is dedicated to warning both the saved and the lost about the unbiblical teachings and practices of Bethel Redding and its associated ministries. This blog is dedicated to calling all who believe the false teachings of Bethel Redding, which includes the group’s ongoing blasphemy of the Holy Spirit–attributing to the Holy Spirit that which is not of Him, to repentance. And, this blog is dedicated to bringing the truth of God’s Word to all who have been captivated by and are held captive to the Bethel Redding cult. I encourage you to watch this video of a sermon I’ve now preached a few times, and will preach again. I believe it is a biblical depiction of the work of the Holy Spirit. While this sermon certainly does not provide an exhaustive look at the Holy Spirit’s ongoing work in the Church, the individual believer, and the world, and while it certainly is not the finest teaching on the subject, I do believe the teaching provided gives ample biblical evidence of who is the true Holy Spirit, enough to show that who the Bethel Redding cult calls “Holy Spirit” is not Him. Truth is the best antidote for error. Truth about the Holy Spirit is the best antidote for the lies Bethel Redding tells about the Holy Spirit. I hope this sermon is an encouragement to you. “Word of Faith teaching is decidedly unbiblical. It is not a denomination and does not have a formal organization or hierarchy. Instead, it is a movement that is heavily influenced by a number of high-profile pastors and teachers such as Kenneth Hagin, Benny Hinn, Kenneth Copeland, Paul and Jan Crouch, and Fred Price. “The Word of Faith movement grew out of the Pentecostal movement in the late 20th century. Its founder was E. W. Kenyon, who studied the metaphysical New Thought teachings of Phineas Quimby. Mind science (where “name it and claim it” originated) was combined with Pentecostalism, resulting in a peculiar mix of orthodox Christianity and mysticism. Kenneth Hagin, in turn, studied under E. W. Kenyon and made the Word of Faith movement what it is today. Although individual teachings range from completely heretical to completely ridiculous, what follows is the basic theology most Word of Faith teachers align themselves with. Kris Vallotton, like Bill and Beni Johnson, work from a theological mixing bowl containing the dry ingredients of Word of Faith, Prosperity, and New Age Mysticism heresies, which are bound together with the wet ingredients of carny and parlor tricks and psychological manipulation. They mix the ingredients well, presenting a poisonous and deadly spiritual cake that the undiscerning and unsaved enjoy. Sounds super spiritual, doesn’t it? But it’s only spiritually deceptive. In order get people to buy the theological garbage they’re selling, Vallotton and Bethel Redding first have to convince people not to be Bereans, not to be discerning, and not to have (as they like to say) a “religious” or “pharasaical” spirit. If those who follow the teaching of Kris Vallotton and Bethel Redding would simply open their Bibles and believe what it says, they will quickly see that what they’re being fed is not healthy meat, but cotton candy laced with cyanide. “Countering Word of Faith teaching is a simple matter of reading the Bible. God alone is the Sovereign Creator of the Universe (Genesis 1:3; 1 Timothy 6:15) and does not need faith—He is the object of faith (Mark 11:22; Hebrews 11:3). God is spirit and does not have a physical body (John 4:24). Man was created in the image of God (Genesis 1:26, 27; 9:6), but this does not make him a little god or divine. Only God has a divine nature (Galatians 4:8; Isaiah 1:6-11, 43:10, 44:6; Ezekiel 28:2; Psalm 8:6-8). Christ is Eternal, the Only Begotten Son, and the only incarnation of God (John 1:1, 2, 14, 15, 18; 3:16; 1 John 4:1). In Him dwelt the fullness of the Godhead bodily (Colossians 2:9). By becoming a man, Jesus gave up the glory of heaven but not His divinity (Philippians 2:6-7), though He did choose to withhold His power while walking the earth as man. 23 hours after posting this image to his Facebook public figure page, Kris Vallotton’s post had garnered 3,127 “likes.” That’s at least 3,127 people on Facebook who are applauding Vallotton’s unbiblical, ecumenical efforts. 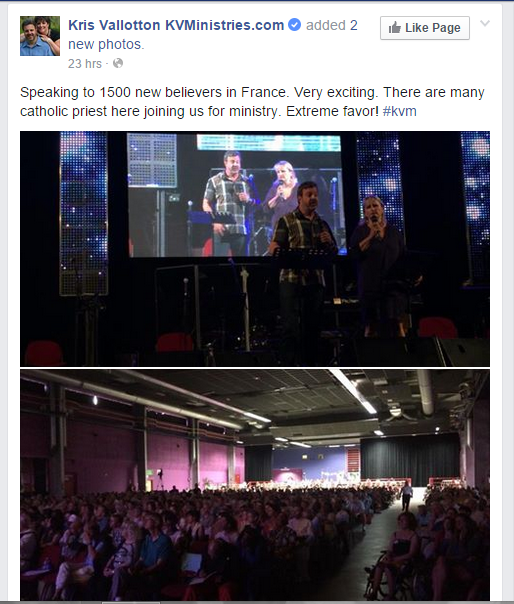 Vallatton boast of 1,500 “new believers” in France. What we don’t know is what these 1,500 souls are “believing.” If it’s Kris Vallotton’s gospel, then they’re still lost. Vallotton also rejoiced that “many catholic priests” are present. They are not counted among the new converts, which, if they had truly come to genuine repentance and faith in the real Jesus Christ, would have been something over which to rejoice. Vallotton counts them as co-laborers, fellow ministers. If the Roman Catholic priests in question follow the teachings of the Roman Catholic Church, they are not Christians. They are apostates. They are blasphemers of God. They are idolaters. And if they are adherents to the blasphemous doctrines of Rome, then Kris Vallotton sinned against God by seeing the priests as co-laborers in ministry. Kris Vallotton can justify engaging in spiritual enterprise with Belial, he can rationalize presumed light having fellowship with darkness, because the Word of God is not Vallotton’s authority. Vallotton’s authority is his feelings–the impressions, which over the years, he has been able to convince himself are from the Holy Spirit. Words of knowledge, prophecies, and the rest of his subjective, spiritual arsenal is what leads Vallotton to believe “ministering” with Roman Catholic priests is a good thing. It’s certainly not Scripture. 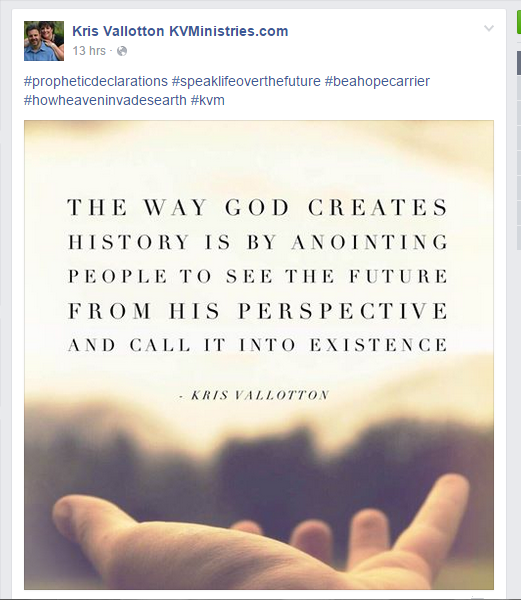 Vallotton’s post is yet more evidence that Bethel Redding is an apostate group. One must deny the Word of God and the God of the Word, one must deny the gospel and the Christ of the gospel, in order to enjoy ministerial partnership with Vatican City’s representatives. Such is the behavior of an apostate, not a Christian. Some may think “apostate” is too strong a word. Is it? What else do you call someone who sets aside the truth of God’s Word and the gospel of Jesus Christ to partner with those who would like crucify Christ if today’s was the world in which Jesus first ministered. In order to present a balanced assessment of this practice, making sure I’m representing “soakers” accurately, I turned to Scott Epp. On September 25, 2014, Epp posted a video on his organization’s YouTube page titled “What is Soaking and How to Soak in the Presence of God.” In the video’s description, we learn more about Epp and his spiritual influences. In Epp’s video, he begins his message by teasing his audience be telling them he has a “secret.” This idea of allegedly receiving new revelations of knowledge from God, of course, fits with neo-gnosticism of the heretical New Apostolic Reformation, the Word of Faith movement, and other new age mystic groups that have infiltrated the Church. As has always been the case with these false spiritual movements, the Word of God is relegated to a text book. Experiences and feelings rule the day. The answer to all of the issues Epp mentions in his message are found in the Word of God. 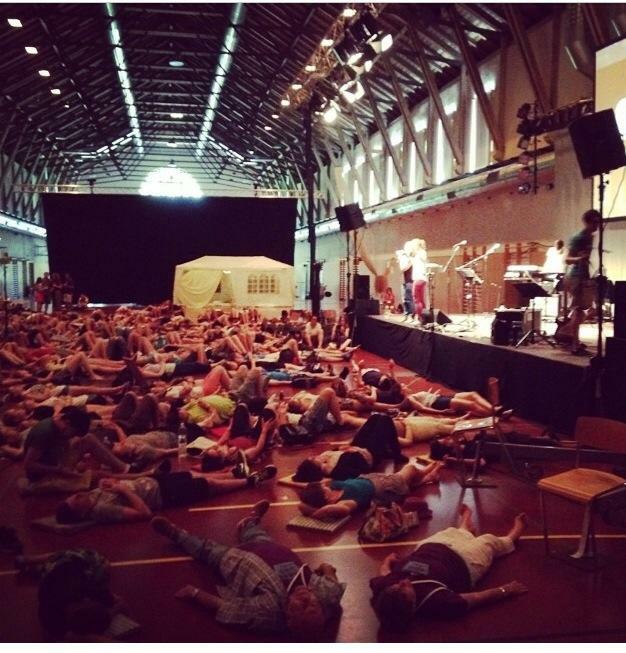 Sadly, “soakers” are encouraged to simply lie down, turn on some music (and play it over and over again), and wait to feel something–to “feel the presence of God.” The “soaker” then subjectively interprets those feelings and automatically assumes the interpretation is of the Lord and from the Lord. As Epp reads the definition of “soaking,” people in the audience begin to make noises and laugh. It’s clear that people are already beginning to check out and go to their spiritual happy place–a place void of the Spirit, void of Christ, void of Truth. Beni Johnson and the rest of the false teachers of the Bethel Redding cult teach and practice “soaking,” going as far as to include necromancy in the practice, by visiting and interacting with the graves of dead revivalists, healers, and the like. While Beni denies she engages in “grave soaking” (also known as “grave sucking”), the evidence is clear. “Soaking” is just one of many unbiblical activities occurring at Bethel Redding. And this practice is reason enough to stay away from Bethel Redding and to warn others to do the same. In June of 2014, my friend James Bynum and a small group of Christians stood outside a Benny Hinn show in San Jose, CA. James and the group were there to warn attendees not to subject themselves to the heretical and blasphemous teachings of Hinn. They were there to lovingly and truthfully proclaim the law and the gospel to all who would hear and listen. I’ve known James and his lovely wife, Diane, for years. James is one of the kindest, gentlest, most loving, and sincere men I know. And he would be the first to object to the compliment I just paid him. James preaches the authentic gospel. He loves the Lord and he loves the lost. At the 45:20 mark in the below video, James is approached by a group of young people from the Bethel Redding cult. James’ interaction with the group speaks for itself. Watch and listen closely. Would a Bible-believing, Jesus-glorifying, gospel-teaching church produce and encourage this kind of behavior and these kinds of beliefs in its people? The obvious answer is no. See and hear for yourself. Again, forward the video to the 45:20 mark. While what you just watched is an abomination out of Bethel Redding, it is no way an aberration out of Bethel Redding. This kind of behavior is commonplace among people who belong to the Bethel Redding cult, as well as people around the world influenced by the false and demonic teachings of Bethel Redding. If you are reading this and you are either a member of Bethel Redding or are in any way influenced by the teachings of Bethel Redding, flee. Please, for the sake of your soul, come out of there. Bethel Redding is not readying people for eternity. Bethel Redding is manipulating people into believing a false gospel, a false Jesus, and false spirits. Are you ready to stand before God to give an account of your life? Are you sure? Bethel Redding’s Bethel School of Supernatural Ministry (BSSM), is ground zero for some of the most outrageous, blasphemous spiritual activities in the world today. Things like this, and this, and this. I came across this video today. In the video, a young lady named Gabrielle Senter is apparently speaking before her church, and shares the testimony of her first year experience at BSSM. Gabrielle certainly seems sincere. And I have no reason to doubt she believes and means everything she says in the video. I do not know whether or not Gabrielle is born-again. I only know as much as you do about her, which is to say what I know is limited to the video you just watched. What struck me and saddened me about Gabrielle’s testimony is how attending BSSM “shattered her plans”–not that her plans were of the Lord (consistent with his will). I simply do not know. Gabrielle had plans to serve as a missionary in “dirty places.” Only the Lord knows if her plans actually included missionary work–proclaiming the gospel to lost people. Taking Gabrielle at her word, the desire to serve the Lord as a missionary seems biblical enough. And what did BSSM do for her? BSSM took her focus off of engaging in missionary work and replaced it with Bethel’s idea of being in the presence of God. Postcards. Coffee. Hugs. And no gospel. No missionary work. Gabrielle’s sincere encouragement to her church family: Ask yourself, “What does look like today?” In other words, “just love people as the Lord leads,” assuming what people like Gabrielle subjectively determines in her heart and mind is, in fact, the Lord’s leading, the Spirit’s leading. The true work of the Holy Spirit’s in the life of the Christian, particularly as it pertains to the Christian’s interaction with lost people, is not a gospel-less work. It is not a conviction-less work. It is not a powerless work that does little more than make the lost person feel good, in the moment, while the well-intended Christian assures the lost person that Jesus loves them, without communicating the law and the gospel to them. Sadly, if Gabrielle and other students at BSSM stop at postcards, coffee, and hugs, if they stop at positive strokes and meeting the perceived physical needs of lost people, all they will accomplish is making lost people more comfortable on their way to hell. How is that love? How is that the love of the Father, drawn from a real sense of being in the Father’s presence? How is that the love of Jesus? How is that a manifestation of the loving work of the Holy Spirit? Recently, I preached a message titled The Work of the Holy Spirit, at the Good News Rescue Mission, in Redding, CA. I hope you will give it a listen. I believe you will see that the Bible’s definitions of the works of the Holy Spirit are different from that of Bethel Redding and BSSM. BSSM is indeed a place of shattered plans. Sadly, it appears that some of those shattered plans might be godly ones, which are replaced by ungodly ones. Yet God remains sovereign. There is nothing Bethel Redding or BSSM can do to thwart the sovereign will of God in anyone’s life, including Gabrielle’s. I just hope and pray God’s sovereign will for Gabrielle’s life is for the Holy Spirit to bring her to her senses and remove her from the influence of BSSM. And, if she is not saved, I hope and pray the Holy Spirit will convict her of sin, righteousness, and judgment (see John 16:8-11), and cause her to be born-again. Will you join me in praying for Gabrielle to that end?